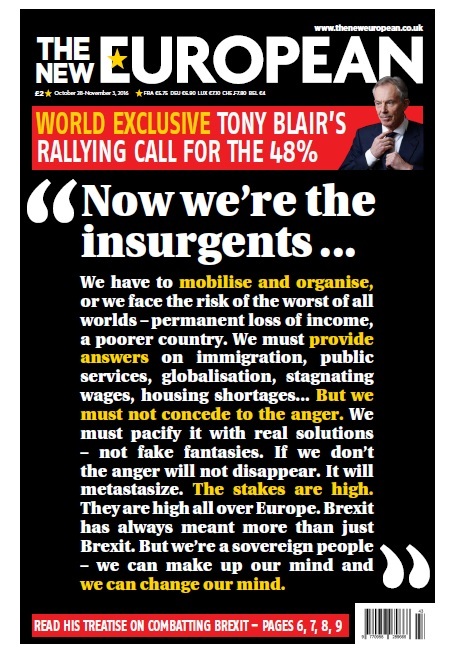 A regional publisher’s pro-European Union newspaper has landed a word exclusive with Tony Blair. Archant’s venture The New European published a piece written by the former Prime Minister in today’s edition, in which he called for a new vote on Britain’s exit from the EU once the consequences are properly understood. The 2,300-word article is Mr Blair’s first major piece since the referendum. In it, he also attacks the increasing extremism of both major political and the “climate of fear” preventing many MPs from speaking their minds. Last month The New European secured an exclusive serialisation deal on the latest diaries of Alastair Campbell, Mr Blair’s former director of communications and strategy. Mr Campbell revealed Mr Blair’s secret plan to quit No 10 and run to be President of Europe. The New European was launched by Archant in the wake of the vote to leave the EU, and is aimed at the ’48pc’ who voted Remain. Hardly a scoop from anyone who held any importance over the Brexit issue was it? I guess the new European wanted us to remain as well… in fact hardlynews at all. I don’t want this man representing me or my wishes to remain part of Europe. Most of the issues he raises in that front-page quote were either ignored or not dealt with adequately during his three terms as prime minister, so it could be argued that he bears much of the responsibility for recent events. Tony Blair is yesterday’s man and should be ignored by the press or, preferably, locked up for the continuing crises caused by his highly-questionable foreign interventions. Time to let it go now chaps, no ones interested in the losing party anymore,let it go and move forward. Unless anyone’s seen any sales figures to prove otherwise? If Tony Blair, the disgraced former Prime Minister who wrongfully took us into one of the longest running and far reaching catastrophies of our time was promoting my favourite brand of tea bags, I’d avoid them like the plague. Any publication that gives him space to voice his opinion should be ashamed of themselves. Whatever anyone thinks of Bliar, and whatever anyone thinks of the EU, surely you can see that this was a top name writing exclusively on a top theme? Certainly dozens of other media across the UK and Europe did. Eg, top news story on BBC with 20-minute interview, leading news line all day etc. Great scoop.